Can you get worms from a cat? 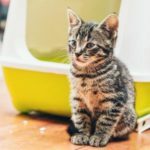 Regardless if you discovered worm pieces in your cat’s stool or vomit, or whether you are just thinking about getting your first cat, the question “Can humans get worms from cats?” is something that frequently bothers people. 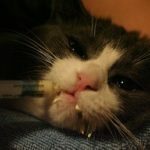 In this article you are going to learn that, yes, you can get worms from your cat or dog, and also how to reduce the possibility of this happening. 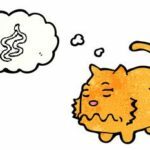 If you have a cat who has worms, or who is suspected of having worms, there’s a good chance that you, your family members, and other pets in the household have them, too. Cats, dogs, and humans share some species of internal parasites, and they can easily transfer from one to another. We are all alike, when it comes to worms. Most commonly, worms are transferred through the ingestion of worm eggs from one animal to another. Worm eggs can be found in your pet’s saliva, feces, or in the soil. They are too small for the eye to see and easily find their way onto human hands. You do not even need to be a nail biter to ingest them. It can happen by simply wiping your mouth or eating food with dirty hands. Oh, and yes, sharing food with your pets (like offering them your ice-cream) is also a common way that worms are transferred between humans and cats. It must be noted that we (and our pets) ingest worm eggs quite frequently, but our bodies are good at dealing with those. We get sick when we ingest more than usual, or when our bodies’ defense mechanisms are impaired. Alternatively, some types of worm larvae can penetrate your skin. For example, hookworm larvae can burrow into the outer layer of human skin, usually feet and hands, causing itching after contact with contaminated soil. 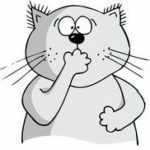 Tapeworms are transferred by ingesting infected fleas, which is often done by cats and dogs (they use their teeth to get rid of them), but—more often than you care to think—may be accidentally and imperceptibly ingested by humans, too. What to do if your pets have worms? Signs and complications associated with internal parasites include vomiting, diarrhea, and malnutrition. 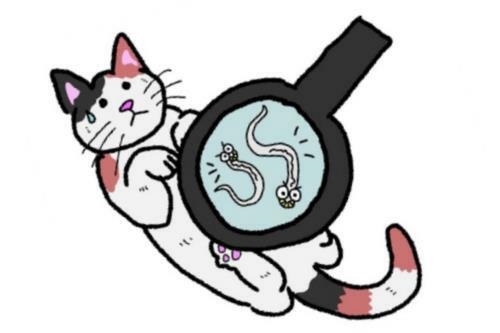 In severe cases for smaller animals, like cats, parasites can cause blindness and seizures, especially if an animal’s immune system is already compromised. If one of your pets has worms (or is just suspected to carry them), your best option is to deworm ALL your household pets simultaneously. In addition, you should seriously consider deworming yourself and other family members, too. 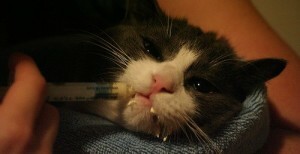 When deworming, you must precisely follow your vet’s advice (or medicine instructions). IMPORTANT: Most dewormers must be used twice within a few weeks. This is because they attack only adult worms, not the larvae and eggs, which will hatch and grow afterwards. It is essential that you give your animal the next dose when that happens, but before new eggs are laid. Otherwise, you will be pulled into an never-ending battle. Routinely deworm your pets. Note that indoor cats must be dewormed, too. Regularly wash your hands, especially after handling your pets and cleaning your cat’s litter box. Keep your house clean. Pay special attention to laundry, floors, and carpets. Effectively fight skin parasites (fleas), as they can transfer worm eggs, too. The main thing to remember is that fear of possible worms should not stand in your way of adopting a cat or having a friendly relationship with your dog. It’s okay to cuddle with your pets, as long as you keep in mind ways to protect your pets and yourself from internal parasites.